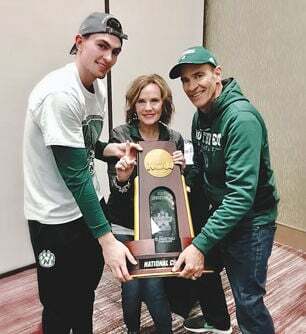 Daric Laing (left) and his parents Cindy and David hold the NCAA Division II Natitonal Championship trophy that Daric’s Northwest Missouri State men’s basketball team won recently. The Bearcats finished 38-0 this season and it was the second National Title they’ve won in the past three years. The Northwest Missouri State Bearcat men’s basketball team capped a 38-0 season by winning their second NCAA Division II Men’s Basketball National Championship in the past three years recently. NWMSU’s Coach, Ben McCollum, was also named the NCAA Division II Coach of the Year. The 38 wins by the Bearcats is an all-time record for any Division I or II school. It’s the most wins in a single season by any basketball team in history. Chariton native Daric Laing is a 6’2” redshirt sophomore guard on the NWMSU team. He was redshirted in 2016-17. Laing is the son of David and Cindy Laing of Chariton and a 2016 graduate of Chariton High School. NWMSU won the MIAA Tournament in Kansas City, Mo., and they won the regional portion of their NCAA Tournament that they were able to host because of their number one seed.